“Wickwythe Hall” by Judithe Little is an emotional and touching story about the lives of three people during World War II, at the time of Hitler’s invasion of France in 1940. Inspired by real people, places and events in history, this whirlwind novel will no doubt leave an imprint on your heart long after you finish reading. Mabry Springs is an American heiress who lives at Wickwythe Hall with her husband Tony. Annelle LeMaire is a French refugee from a nunnery who fled when German soldiers crossed (went around) The Maginot Line, a barrier built along the border of Germany. Reid Carr is an account representative for Pol Roger Champagne, works under cover as a top level liaison between Churchill and Roosevelt. All three have suffered extreme loss and hardship throughout their lives and are determined to overcome their personal tragedies. As the innermost secrets of each begin to unfold, the war moves closer to England, and Wickwythe Hall, a beautiful estate in the English countryside becomes a safe haven for many. An enchanting historical fiction novel, “Wickwythe Hall” is a well rounded and beautiful story that is part espionage thriller, romance, coming of age, and history. Judithe Little writes with a seamless flair, taking the readers across countries and settings right alongside her characters. Using stunning detail, she completely absorbs her readers, with scenes so vividly drawn one feels to be an actual participant in the drama. The author’s extensive research stands out through her storytelling, depicting with heart-wrenching detail some unforgettable moments that actually called me to want to learn more about this period in history. One such moment was Operation Catapult, Churchill’s devastating maneuver to keep the French naval fleet out of Hitler’s hands. The tension building on both sides is incredible with the French trying to convince the English that they will not give up their fleet to Hitler. Churchill cannot take the risk however, and England’s attack on her own ally is sobering and chilling to the very core. And while the striking authenticity of historical events portrayed in “Wickwythe Hall” are compelling enough to keep readers engaged, for me it was the characters that captured my heart and made this story shine. I felt I was actually experiencing the challenges of each from inside their heads. Every character pulls you into their point of view, from the three protagonists, to the kitchen help at Wickwythe Hall, the elite relatives and guests staying at the manor, to Winston Churchill—each one draws you into their head and I became heavily invested in the outcomes. 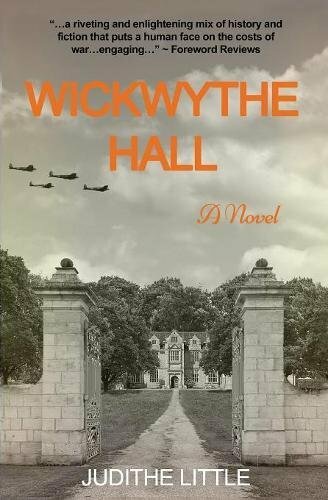 “Wickwythe Hall” is a must read for fans of historical fiction during the WWII era. With a dramatic storyline, engaging characters, and a romantic angle that leads to a surprising conclusion, Judithe Little has created a story that will capture the hearts of many in this noteworthy debut.